i have been hounding a friend of mine for 3 years to let me into her closet to shop. she is one of those people who have been collecting vintage apparel for years and years...... and has become one of my few style hero's. well, she has finally come to her senses and launched a brilliant business, StyleKouncil. she is now styling private citizens and cleansing and updating their wardrobes with both new and vintage pieces, even some pieces from her own private collection. this is brilliant for her and if you need an update or consult for a special event...she's and her new business partner are your gal's. 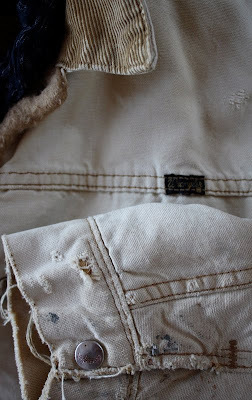 anything from vintage chanel to rugged and vintage special addition levi's. too good to be true. so, this opened up our conversations of my raiding of her closet, but instead she edited some items based on a few request from me AND came over to my place and did a private trunk show....i scored a few coveted items. i have been wearing this wrangler jacket every day for the last 2 weeks and there are no plans in the near future to change this routine. and these wingtips are beyond all hopes for detail. more to come on StyleKouncil. the website is launching soon. that jacket looks amazing on you! Those wingtips are SNAZZY...and there's nothing better than a jacket that becomes your buddy! oh yeah... bring it on!